Jesse ripped off the paper and the box flap and with childish astonishment withdrew a black, ironworked model of a salacious naked woman, her arms crossed beneath her head, her legs lewdly cloven and lifted.”It’s a bawdy bootjack,” Bob said. “It’s a bawdy bootjack,” he said. “It’s something I’ll cherish always,” said Jesse. “Then we both have something to cherish,” said Bob. I understand what “bawdy” means and I know what a “bootjack” is, yet the association of both words stroke me as funny and funny it was because a Google search turned up nothing. After doing a little research, a friend of mine, James, pointed me in the direction of Naughty Nellie and although the item seemed to perfectly match the description from the book there was only one problem, she wasn’t naked. Your description looks very similar to a Naughty Nellie so my question is this, and I know it might seem a little strange and I feel weird asking but do you mean a bootjack that’s like a Naughty Nellie but actually naked or is it one of those iron cast Naughty Nellie without paint that could possibly pass as naked? I saw it in a museum ages ago. 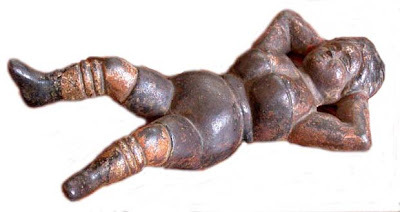 An iron, naked, female figurine with her legs spread and painted black that was used to grip the heels of boots and was in fact called by the museum a “bawdy bootjack.” Naughty Nellie sounds like a variation on same. Which leads me to believe that one, the expression “bawdy bootjack” was “made up” by the museum Ron Hansen visited and two that it was indeed a naked version of Naughty Nellie.If you stumbled on this post, the odds are you’ve been reading The Assassination of Jesse James and were wondering the same thing. Then I don’t feel so crazy.